Today's post consists of my ultimate wishlist for 2015; I have only created 4 categories, otherwise I would probably be here for ages. The categories I chose were makeup, brushes, clothes/accessories and perfumes. I may continue and create a second post following this with a variety of things and not just keeping it restricted into the fashion/beauty industry ( for example, cds, technology, books etc). Marc Jacobs Daisy Dream - Light and airy, Daisy Dream is both floral and fruity. The fragrance captivates with delectable top notes of blackberry, fresh grapefruit and succulent pear. The heart imparts a rich, feminine jasmine, notes of lychee and blue wisteria. A dreamy drydown of white woods, musks and coconut water. Yves Saint Laurent Black Opium - An addictive gourmand floral with notes of: Black Coffee – for a shot of adrenaline; White Florals – to instantly seduce; and Vanilla – for sweetness and sensuality. Paco Robanne Lady Million - A fresh woody floral, Lady Million Eau de Toilette is a multifaceted, luminous, fresh and transparent interpretation of the original fragrance. Christian Dior Miss Dior - It glides from the sharp charm of a fresh, fruity, citrus prelude into blossoming floral notes, then on to the noble elegance of patchouli, before finally concluding with musk, the last trace of memory With veritable riches concealed in her heart, Miss Dior develops in the most intense and astonishing way. Jean Paul Gauliter Classique - A totally seductive fragrance...Sensual, sophisticated, bewitchingly seductive rose. Top note: Rose, rum. Heart: Vanilla orchid. Base: Sandalwood, tonka bean. Too Faced Chocolate Bar Palette - Very recently, I have been wanting this so so badly. I have a complete crush on eyeshadow palettes, not very good for my purse but oh well, and don't have anything like this in my collection. I have heard so much about this product and just envy everyone who has it...it is about time I bought it for myself! Soap and Glory Supercat Liner - My bestie lent this to me very recently and I absolutely loved it. I didn't think I would be into a felt tip styled liner but I am in complete awe at how easy it is to apply wings with it. Definitely need to bag myself this in 2015! Mac Studio Fix Fluid Foundation - Over 2014, I wore this foundation to the parties I went to with my best friend Jess (helloitsjessxx.blogspot.co.uk). I just need this in my life asap, as the coverage makes my skin look flawless! Oh, and I probably owe Jess a lot of it back too! The Balm Mary Lou Manizer - A very recent craving for my beauty wishlist is the very talked about higlight from the Balm. I only heard about this brand in 2014 and it became more popular as the year progressed. The highlight looks so beautiful and glamorous on all bloggers I've seen photographing it. Nars ITA - I'm so desperate to try this gorgeous little fella out. It looks perfect for contouring and the thin dense bristles look like they would go a precise job when carving in those fake cheekbones. 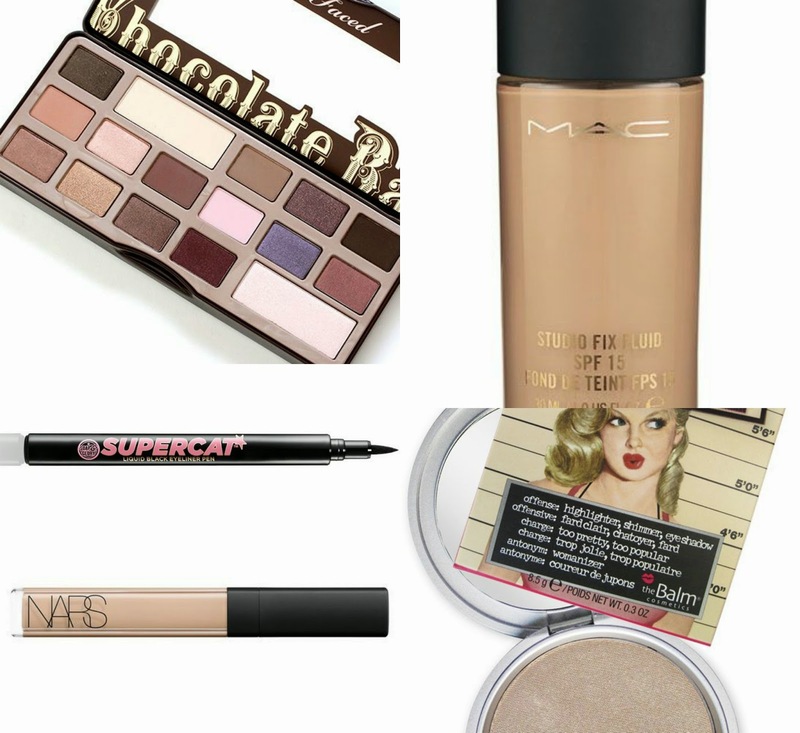 Mac 217 - A great must-have from most of the beauty bloggers in town. Sadly, I always forget about the brushes when at a Mac stand and am mesmerized by the many other treasures the brand holds. I must try and get this some time throughout the year, as I'm a sucker for eye blending brushes. Bobbi Brown Face Blender - Ever since Tanya Burr raved about this in a video long ago I have been eyeing it up. The way it effortlessly blended in her makeup made me envy her so much and I just want to get this myself to see if it works for me too. Real Techniques Bold Metals Collection - A very recent addition to the all so famous 'Real Techniques' brushes are the new bold metals collection, ever so beautifully designed by the Chapman sisters! The rose gold ones are my favourite, not just because of the colour but for the blush and contour brushes. 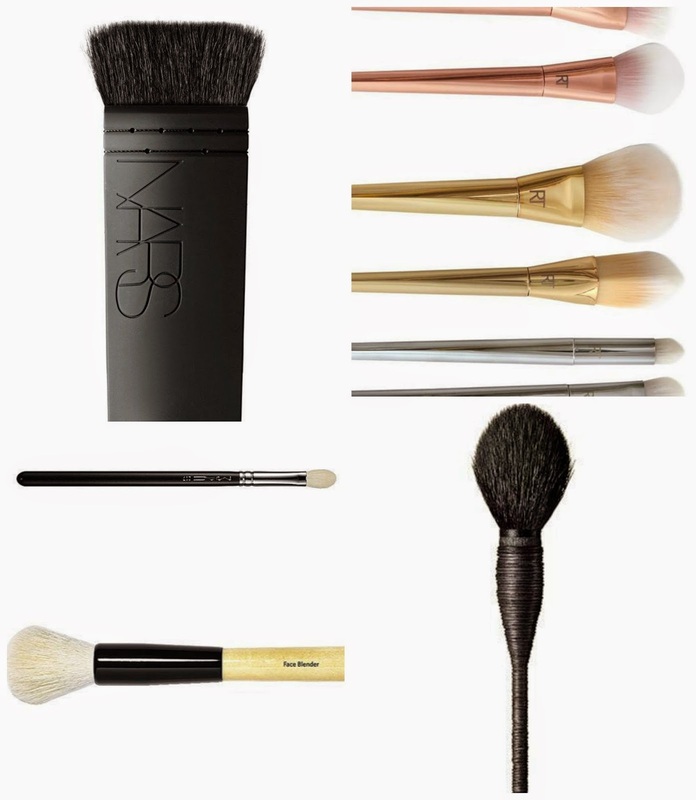 Nars Yachiyo - Is it just me that finds this brush really edgy? Probably. I just have a thing with fluffy blusher brushes, okay?! Black Laced Playsuit - I want to add this little beauty to my wardrobe right now. It is from missguided and I am in love with the elaborate lacey detailing on the arms of the playsuit. This would be perfect for a night out with your friends! Burgundy Floppy Hat - Every time I see one of these in a shop, I always have to try them on. My family and friends say they really suit my hair colour. The only thing is, it just appears, to me, as more of an autumn/winter fashion statement so maybe I should buy it around september again? Sigh. Tartan Scarf - A classic - I mean everyone has one of these nowadays and I want to join the trend. Not just to 'get in with the crowd', I just love the look of thick chunky scarves paired with a simple tee and leggings - cosy but stylish is my fave look. White Turtle Neck Jumper - Oversized jumpers and shirts have been a big thing in my wardrobe for the last few months. However, I have recently fallen for this large white turtle neck jumper that looks really chic, yet so warm and cosy. Ugh, that look is to die for and I love how this model has her hair too. My most dearest male friend, Ben, has just created a blog and it would make me super super happy if you went a checked it out - lifeofbenp.blogspot.co.uk. He will be writing lifestyle posts; discussing various topics, anything he has done in the day and just general life issues/events. I love his writing style and I'm sure you will too:-) So please please please, would you all be so kind as to view it and leave a lil comment on any of his posts - he will seriously appreciate it! Love you Ben! i love the too faced chocolate bar palette, such a great buy!